It is difficult to imagine a more heavenly place in the world than Flic en Flac, on the west coast of Mauritius. Here, the splendid meets the divine, in a breathtaking natural poetry. It seems as if all the natural elements imaginable have come together to make this great unknown Mauritian place into a veritable Garden of Eden. 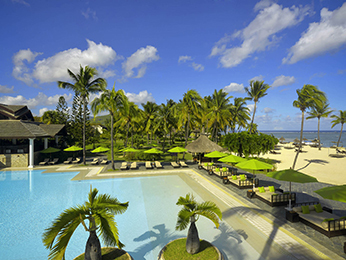 With little wind and a location that provides easy access to the capital, Port Louis, Flic en Flac is the perfect place for anyone in search of tranquil, idyllic retreats. But the translucent waters of the lagoon, protected by a coral reef, are sure to wake up the explorer in you. Complementing this environmental grandeur are a whole raft of facilities that allow you to enjoy the natural surroundings, particularly the beach of Flic en Flac. What a long way the fishing village of Flic en Flac has come in ten years to become one of the jewels of the whole of Mauritius! The scuba diving is of course the queen of the deep blue with a seabed that's home to the most fabulous fauna and breathtaking flora, like the dolphins that you're sure to come across. Not far away, surfing enthusiasts can head for Tamarin Bay where they'll find the best beach on the island to indulge in this board sport. However, it will be with a visit to Chamarel, not far from the village, that the traveler will discover a great source of national pride: The Seven Colored Earths. Flanked by a waterfall at the foot of which you can swim, this place puts the perfect finishing touches on the painting of paradise that is Flic en Flac and its region: The Black River. As an advocate of relaxation and well-being, Flic en Flac surprises its guests with its natural perfection. The simple act of admiring a sunset from its delightful beach or as you enjoy a fresh fruit cocktail feels like a symphony being played by Mother Nature, all around us.